Last month he recruited a ref. 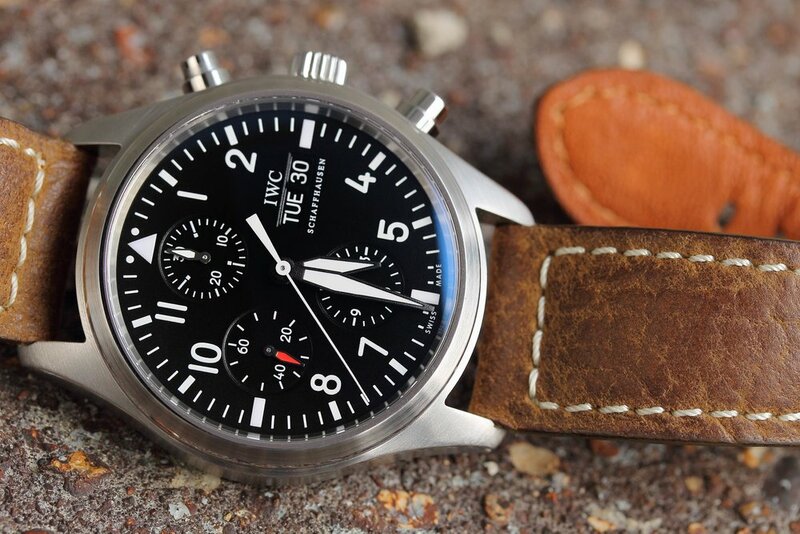 3717 IWC Pilot’s Watch Chrono-Automatic for the job. This IWC classic was discontinued a few years ago, so Justin had to scout a pre-owned example. One piece of advice he received before commencing his search was to find one with a stainless-steel bracelet: It’s generally more expensive to source a bracelet separately. So besides a mint condition IWC Pilot's Chrono with all its proper documentation, he had his heart set on one with a bracelet. He turned to his favorite dealer: Ebay. A quick search and filter turned up exactly what he wanted: A pristine, full-set, 2012 serial number. All that was left to do was a little price negotiation, check out using his Paypal account, and anxiously wait for the delivery man. However the seller wasn’t budging enough on the price for Justin...so the deal died. But Justin was on a mission. He wasn’t about to retreat at the first sign of adversity. He found anotherref. 3717 on Ebay. Another crisp 2012 example complete with box and paperwork. And this time, the package also included receipts from a recent IWC service. The one catch: This Pilot's Chrono came on a standard-issue black crocodile leather strap. The silver lining though: It would cost less sans the bracelet - a price more on par with Justin’s valuation of the watch. And the more Justin thought about it, he was “fooling” himself thinking a bracelet was really that important: He owns a Tudor Heritage Ranger that came on a factory steel bracelet...which he’s never worn on the watch. He's truly more of a “strap nerd,” always jonesing for the latest distressed leather or rugged canvas from talented strap artisans that seem to be popping up all over the place. Without a doubt, the GMT Master (the ref. 1675 more specifically) has always been one of my favourite Rolex sports models. There's always been something about how the four hands trace the multi-coloured bezel that always seemed to captivate me. Upon first beginning to collect, I knew that one day I'd need to add one into my arsenal, and 2 weeks ago, that day came. I had just finished off my last exam of high school, and decided a trip to the local vintage watch shop was in order, which I now realize was a foolish and dangerous decision! Once I walked into the store, I immediately noticed a beautiful "Root Beer" 1675, which I have since endearingly dubbed the "Curious George", for its chocolate brown and yellow colour scheme. It wasn't exactly the GMT I pictured myself owning one day, but sometimes you just find a great looking piece, and everything clicks. Needless to say, a deal was struck and it came home with me that day. Now, it's worth noting that this example is not exactly all original, in that it's currently mounted on a full steel, folded oyster link bracelet. Although it would make more sense to have it on the correct two tone bracelet, I've been enjoying it just as is, in that it wears a little more casually, and I've never been a fan of two tone watches to begin with. Two weeks in, and I'm still picking up on details and nuances that catch my eye - one of the many reasons why I enjoy a good vintage watch. I can confidently say that this was most definitely a wise purchase, and I look forward to watching this one age further, as the years pass. On business in Amsterdam last month @ottsby had some time to kill before meeting colleagues for dinner and drinks. Just his luck, his hotel was conveniently located on the P.C. Hooftstraat - a famous Dutch shopping corridor with a murderers’ row of watch boutiques: IWC, Rolex, Swatch Group’s Tourbillon - heaven for a "horology nut." @Ottsby found himself inside the JLC boutique talking shop with a salesperson about their historic models (e.g. The Reverso, Memovox Deep Sea Alarm). Naturally the newest darling of the manufacturer came up: The limited-edition, much acclaimed Geophysic. The salesperson let on that a client recently opted not to purchase a Geophysic that he special-ordered. And just like that, one was available. A WIS (Watch Idiot Savant) would go so far as to call this an act of fate: No matter how one looks at it, @ottsby found himself in the position of having a second chance to make a first impression. With a strong U.S. dollar in his pocket and a green light for tax-free shopping, he jumped at the opportunity. Did you get a new watch recently? Want to share your story? Email info@watchpatina.com with a brief outline of your latest #incoming - and of course - your best picture. You’ll hear back within 24-hours about being featured in an upcoming New Watch Alert installment.